New stamp issues often have themes like great inventors or national parks. 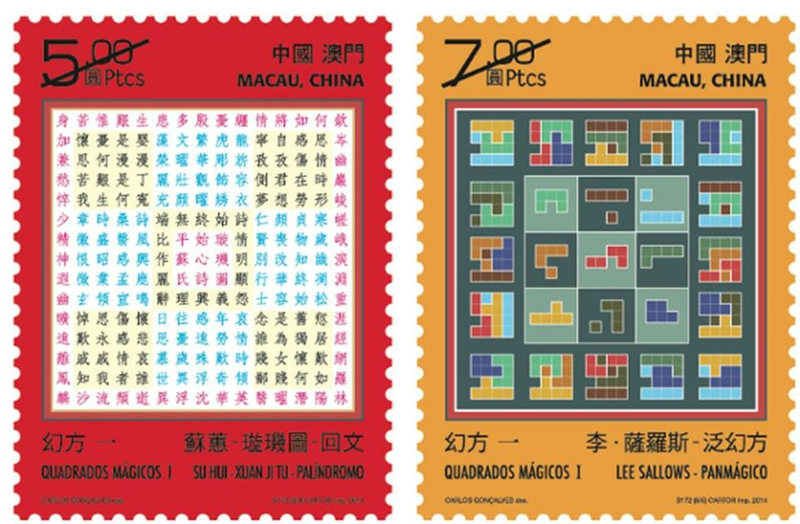 This fall, Macau, the island that was formerly a Portuguese colony and now is part of China, issued a particularly creative set of stamps: instead of people and places, they feature some of the best efforts of the last 2,000 years to create what are known as magic squares. A magic square, in strict terms, is a grid of consecutive numbers, beginning with 1, in which each row, column, and diagonal adds up to the same number. The form appears in different cultures throughout history. 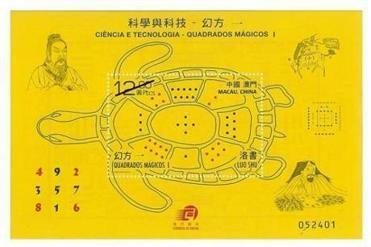 Famous examples, featured in the Macau set, are Albrecht Durer’s “Melencolia I” from 1514, and a magic square made of dots on the back of a turtle, reflecting an ancient Chinese myth. From an ancient Chinese myth, the dots on the back of the turtle sum to 15 in each row, column, and along the diagonals. Others take the spirit of the magic square, but use letters or shapes instead of numbers. 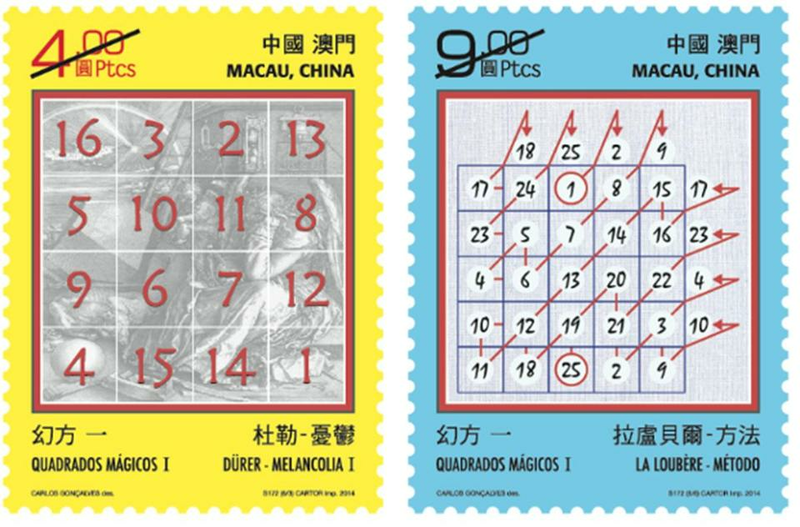 The 2 pataca stamp (the pataca is Macau’s currency) features a Latin palindrome from the start of the first millennium, with letters in a grid that repeat the same five words in both the across and down rows: Sator, Arepo, Tenet, Opera, Rotas. (The translation is a matter of debate, but it says something like, “The Creator holds the working of the spheres in his hands.”) Another stamp contains the 15x15 central section of a gigantic palindromic poem that was written in 4th-century China and can be read 2848 different ways. The most contemporary design is a “geomagic square,” similar to the video game Tetris, where individual pieces in each row, column, and diagonal can be fitted together to create the same master shape. Philately, or stamp collecting, is a dusty activity that can feel almost inert. The most unique feature of these Macau stamps is how alive they feel. Even when the designs are very old, they still wink and draw you in.